How Do Producer Points Work in a Record Deal? 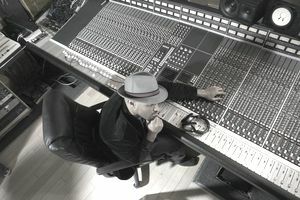 A music producer is in charge of the overall sound and feel of a record or album. He helps to create and deliver recordings. He makes sure that the end product is the best it can be when a band or musician is recording or mastering a song or even an entire album. The role requires talent and expertise, and it includes wearing many hats. The producer often gives performance advice and direction to musicians or makes sure the sound engineer is on track. His job is to oversee every detail of a song or album in the hope of producing a major hit. So how are producers paid for all this work? More often than not, they receive points. They might be paid on the entire album. For example, the producer might get 3 points or 3 percent of the royalties a record earns. Points might also be paid just on particular songs on an album. If the producer gets 2 points on 5 songs on an album that includes 12 songs, he would get 5/12 of 2 percent of the royalties earned by the album. Points aren't awarded to all producers, and the number of album points given can vary a great deal, anywhere from 1 point up to 5 points or more. It depends on the producer, her talent, her reputation, her experience, and the quality of her overall work. In the art world, Picasso could be expected to earn far more points than an artist who has just sold her first painting. Deals are sometimes structured so that the points a producer receives increase as the album meets certain sales thresholds. And yes, most producers do ask for points, at least those who are business-savvy and who know the industry well. Although 3 points might not sound like much, it can be a significant windfall if a song or album is a blockbuster hit. Points are sometimes paid based on dealer prices for the album, but sometimes they're paid on the retail price. They're often paid on the suggested retail list price (SRLP), which is an estimate of what most retailers will charge for the product, but they might be paid on the published price to dealers (PPD). Think of this as the wholesale price of the product. Needless to say, the basis can make a big difference in what the producer earns. If you're negotiating a contract for yourself, you'll probably want to go after an SRLP percentage. Deals are increasingly being seen where the percentage is based on the artist's actual revenues—not the label's revenues. This percentage might be much higher than just a few points because the artist is already receiving just a certain portion of the label's revenues. Points and songwriting credits are two different things. It occasionally happens that a producer will take a hand in tweaking an existing song or in helping to create one from scratch to achieve that desired hit record. In this case, he might be entitled to a songwriting credit in addition to points for his other work on the project. It's not out of the question that a producer will take on a job in exchange for an hourly rate or a flat fee instead, but make no mistake—you get what you pay for. Anyone willing to accept these terms might not be the best the industry has to offer. Music producer contracts and agreements can protect everyone involved in the recording by explicitly detailing duties and compensation.